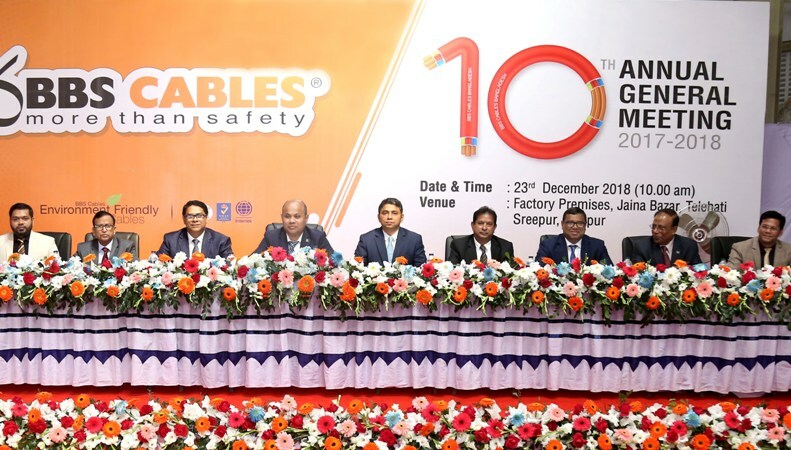 The 10th Annual General Meeting (AGM) of BBS Cables Ltd. for the year of 2017-2018 held on Sunday at the factory premises at Jaina Bazar under Sreepur in Gazipur. The meeting was presided by Engr. Mohammad Badrul Hassan, Chairman of the Company. Engr. Abu Noman Howlader, Managing Director and other Directors, Company Secretary, top-level employees of the Company and Shareholders were also present in the meeting. The 10% Cash Dividend and 15% Stock Dividend also approved by Shareholders in the meeting.